An outstanding ballplayer with a great career ahead of him, Jim Whitfield told his parents "don't worry about me," as he headed into combat. After graduating from high school, Whitfield played for the Travora Mill team in the Tri-City League. Occasionally turning his powerful arm to pitching, he threw a 32-0 four-hit shutout against Hopedale, on July 4, 1938, in which he also collected six hits, three of which were home runs that cleared the left field fence. Later in the month, he struck out 14 and had four hits in a game against Belmont, and on August 25, he pitched an 11-0 one-hitter against West Burlington. In 1939, Whitfield was playing for the May Hosiery Mill team and in a late-August contest against McEwen his "smoking bat accounted for four clean slugs in five tries at the platter." Whitfield went on to play for the Cameos, the semi-pro team of the May-McEwen Kaiser textile mill, where he played alongside future major leaguer Howie Moss. By May 1941, he was batting over .650 with the Cameos and had already hit six home runs when he accepted a $5,000 bonus to sign with the St. Louis Cardinals (Moss also left the Cameos at the same time, being reinstated to the eligible list after being out of professional baseball for four years). Whitfield bought himself a Plymouth convertible with the bonus but also gave $100 to the Graham United Methodist church. 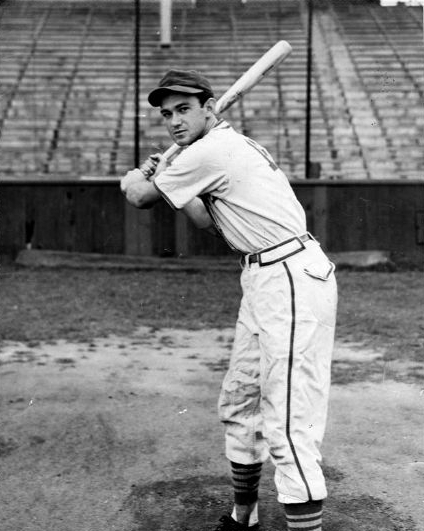 For the 1941 season, the 21-year-old was assigned to the Albany Cardinals of the Class D Georgia-Florida League, where he got off to a flying start. After a month he was batting .327, but an infected spike wound resulted in blood poisoning and he was briefly hospitalized. Returning to the team but still troubled by the injury, Whitfield finished the season appearing in just 26 games for a disappointing .238 batting average. That was to be his only taste of professional baseball. In November 1941, Whitfield entered military service with the Army and took basic training at Camp Croft, South Carolina. Still at Camp Croft in March 1942, he was promoted from private to corporal while with B Company of the 34th Training Battalion. On September 17,1944, Whitfield landed with the 322nd RCT at Red Beach on the northeast shore of Angaur. Japanese forces had not defended the beach but as U.S. troops moved precariously inland they were faced with intense resistance. By September 20, most of Angaur was secure and it was the job of 322nd RCT to mop up the remaining Japanese forces in the northwest corner of the island. Cornered and led by the fanatical Major Ushio Goto, the remaining defenders were prepared to fight to the death rather than surrender. On September 22, 1944, during an enemy mortar attack, Whitfield was killed. He was buried at Manila American Cemetery in the Philippines. Following his death, a baseball field was named in his honor by his comrades; its exact location has been lost with time but it may have been at New Caledonia where the 81st Infantry Division went for rehabilitation at the beginning of 1945. Thanks to Jay Ashley, managing editor of the Burlington Times-News, for help with this biography. Thanks also to Astrid van Erp for help with photos and information for this biography.